Vogtländische Maschinenfabrik AG (VOMAG) was formed in 1881 in the Saxon town of Plauen. Originally formed to construct lace making and embroidery machines, VOMAG rapidly diversified, and by the time of the First World War began producing trucks for the German Army. After the war, the military trucks were adapted into buses and heavy goods vehicles. The FLAK 88 self-propelled gun was an attempt to provide highly mobile anti-aircraft artillery which could accompany mechanized Army units in the field. Using a 7 or 660 heavy goods vehicle chassis, the gun could be driven on any road without damaging it through its weight. Between 21 and 24 gun carriages are known to have been produced. None survived the war. The gun carriage looked like a regular heavy goods vehicle, with the gun carried on a flatbed behind the cab and forward of the rear axles. The rear box served as storage for the ready-use ammunition and other stores for the crew. Collapsible mesh-screen sides provided a platform for the crew when the gun went into action. Being primarily an aircraft builder, I am not very familiar with military vehicles, but I do know good models, and this is one. The kit is very nicely moulded in Roden's familiar slightly brownish plastic. There is little flash and the mouldings are quite petite. In fact, I'm not sure how I'll get some of them off the sprues without breaking them in half. The kit is supposed to contain an acetate sheet with the windshield glass outlines printed on it. The review sample either didn't have it, or it slipped out while I was opening the bags and got eaten by the carpet monster. Its absence is not critical; making flat windows is not difficult, especially when each one is half the size of a typical postage stamp. This model has a full chassis, engine and running gear. The chassis is to be trimmed short, perhaps a hint that a VOMAG bus or heavy goods vehicle will follow on later? 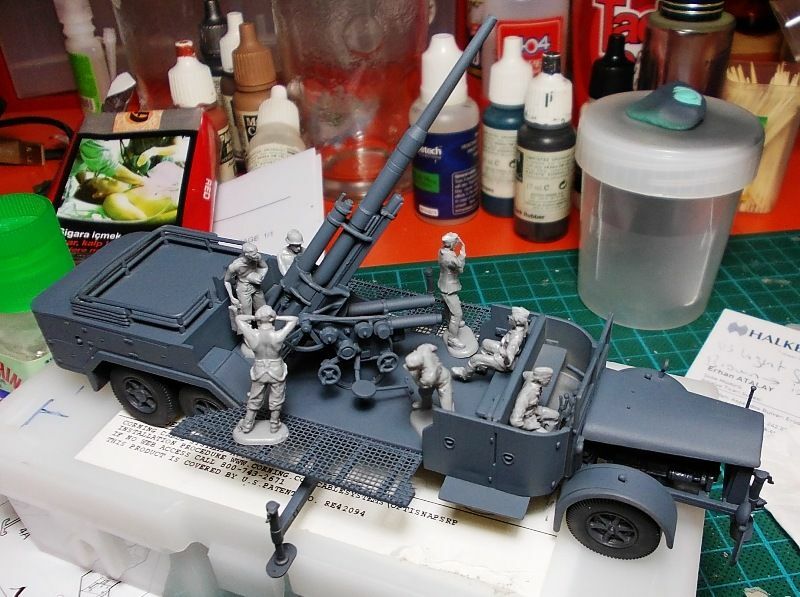 The drive train, suspension, engine and exhaust pipes are added to the chassis in the first few construction steps, then the chassis flips over to accept the sub-frame which supports the gun. The floor, firewall, front fenders and rear box are constructed next, finally providing something which looks like a vehicle. The fighting compartment sides are constructed from a frame and some white plastic mesh (which looks a lot like window screen, to tell the truth). 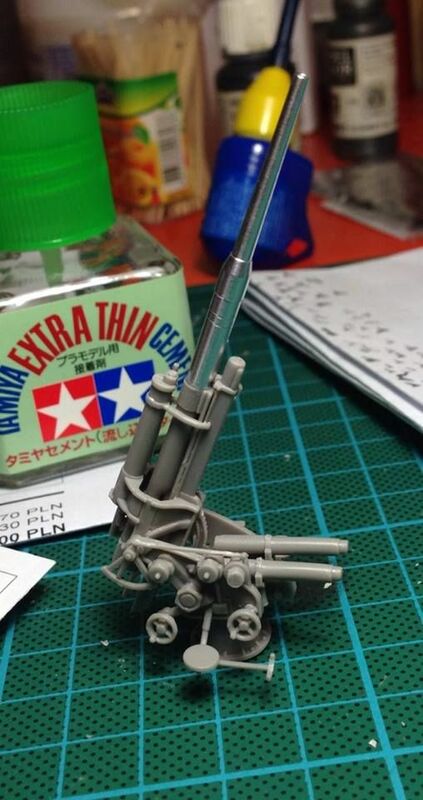 They may be assembled up or down, as the modeller desires. If the gun is to be posed in action, the 2 stabiliser arms may be assembled in their deployed position, at right angles to the vehicle sides. If it's on the march, the arms must be trimmed to show the foot-plates raised. Two smaller supports attach to the front and rear bumpers, extended or raised as desired to match the side supports. As moulded, all 4 supports are designed to be shown deployed. The gun and its elevating and traversing mechanism take up the final 5 construction steps. The gun barrel is moulded solid, and really ought to be drilled out. 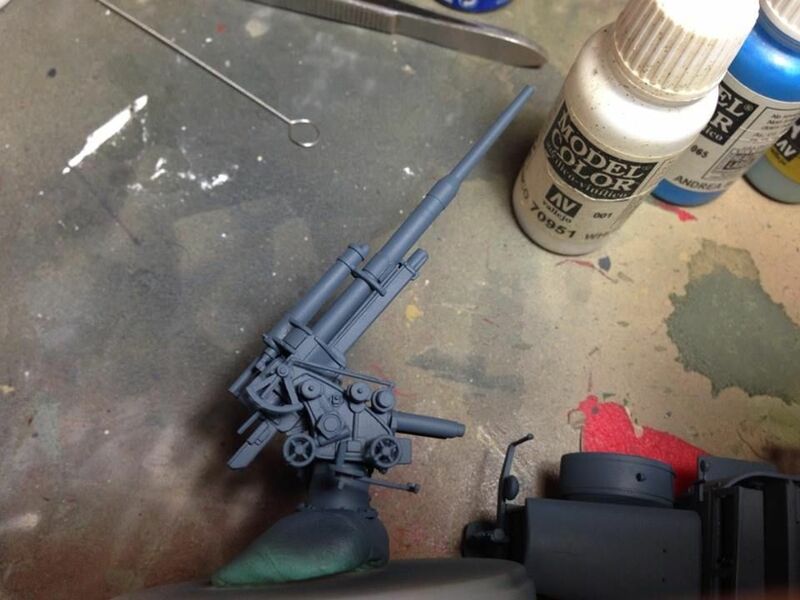 It appears as if the gun can be made to elevate, or to be glued into whatever pose the modeller desires. I don't compare models to drawings or published measurements. 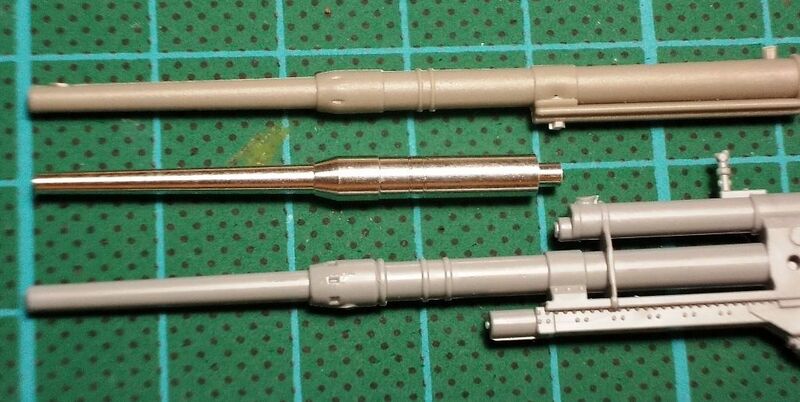 When assembled it looks like a VOMAG/FLAK 88. 3 An unknown vehicle 42 Flak Regiment, Budapest Spring 1945 in a speckled camouflage in the late war colours of Ochre, Olive and Red-brown. This scheme would be very challenging to create convincingly. 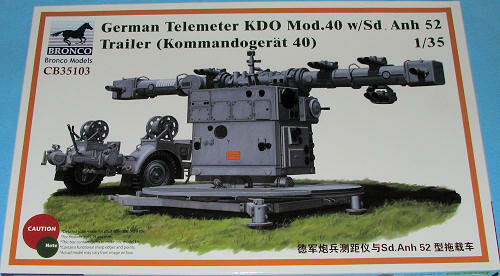 This is an interesting little model, which should appeal to both military and aircraft modellers. A Flak 88 in very dramatic nighttime action. The fighting compartment sides and support arms are easily seen in their deployed positions. A battery on the road in in Winter with the fabric roof up. The kit provides some roof supports, but the instructions only show them in their stowed position on the rear box. The canvas top would have to be scratchbuilt. Lows: Frighteningly thin parts. One paint scheme is not for the fainthearted. No raised roof option. Verdict: A kit which appeals to both armour and aircraft builders. Matt you are not going mad, the links had disappeared after being uploaded. Good review. I think, need a metal barrel.. Thanks Darren, nice to know I'm not cracking up (just yet). Erhan, the model looks great, look forward to seeing more of it. It's certainly big and imposing. Not too sure about that crew man posing with his shirt off... Where are the crew from? 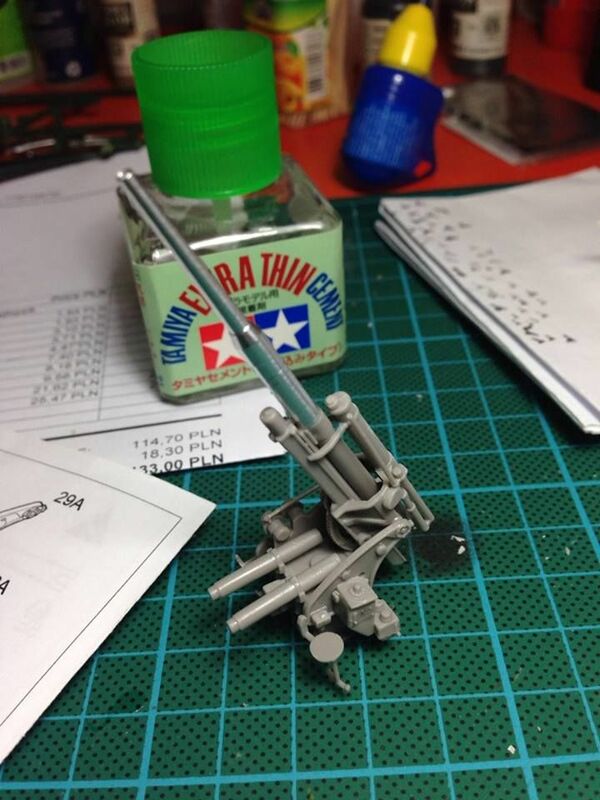 Erhan; The build looks great as is usual with your efforts of late; however the metal barrel surprisingly looks the least accurate, with the Zvezda offering looking the best of the bunch. 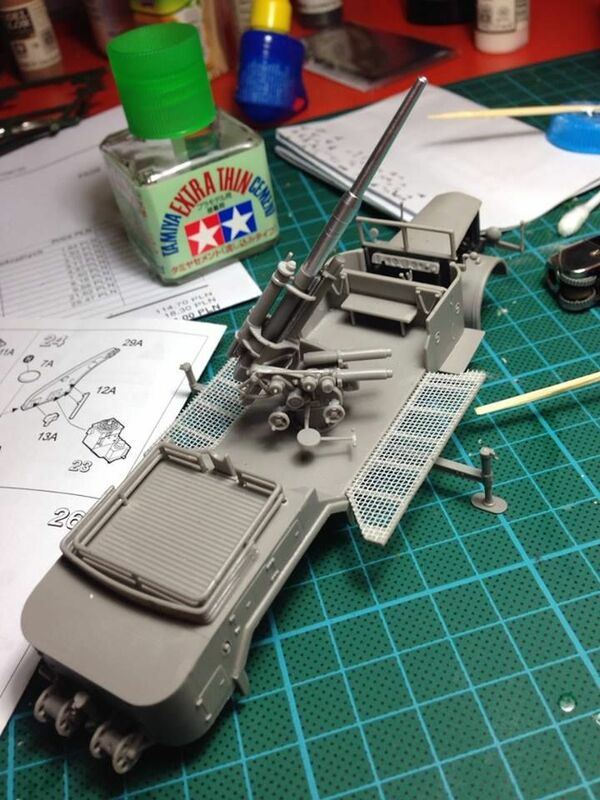 Erhan, I'm very encouraged by your WIP photos, especially the mesh sides. What kind of glue did you use to fix the mesh in place? Also, did you have any trouble with the frighteningly thin parts? I must admit that when this sample arrived I was a little trepadacious of reviewing it, but the more I looked at it, the more I was impressed by the moulding and execution. It's a really special little model. That was my thought as well, Robin.